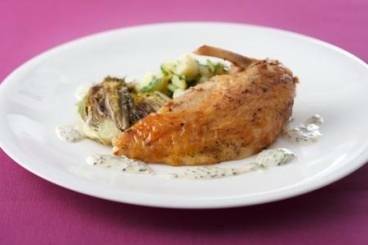 Roasted guinea fowl breast served with a warm salad of waxy ratte potatoes, braised baby gem and a pea and wholegrain mustard sauce. Place the potatoes in a sauce pan of cold salted water and bring to the boil. Reduce the heat and simmer until tender. When the potatoes are cooked, drain and allow to cool. Peel and finely dice the shallot. Pick and roughly chop the parsley. Make the dressing for the potatoes by whisking together the Dijon mustard and white wine vinegar. Slowly whisk in the olive oil until you have a thick dressing. When the potatoes are cool enough to handle, cut into small pieces and dress with the vinaigrette and stir through the shallot and parsley. Keep to one side. Peel and finely dice the shallot and garlic. Pick the leaves from the tarragon and carefully chop. Sweat the shallot in a sauce pan with the butter until soft. Add the garlic and cook for a minute. Deglaze the pan with the white wine and reduce the wine by half. Add the chicken stock and reduce by half. When the stock is reduced add the double cream. Bring the sauce to the boil and then pass through a sieve. Stir in the wholegrain mustard and check the seasoning. Before serving, reheat the sauce and add the peas and tarragon. Cut the baby gem in half lengthways. Pick and roughly chop the parsley. Heat a frying pan until hot and add half of the butter. Cook the baby gem cut side down until they are golden brown. Turn over and season with salt and pepper. Add the sprigs of thyme and the chicken stock to the pan and bring to the boil. Reduce the heat to a simmer, add the remaining butter to the pan and cover with baking parchment or foil and cook for 5 minutes until the centre of the baby gems are tender. Add the chopped parsley and keep warm. Heat frying pan until hot and add the sunflower oil. Season the guinea fowl with salt and pepper. Cook the guinea fowl skin side down until the skin is golden brown. Seal the flesh side and then turn back over to the skin side and transfer to the oven and cook for 8 to 10 minutes. Reheat the sauce and add the peas and tarragon. Place the potato salad in a ring in the centre of the plate, place a braised baby gem on top. Slice the guinea fowl supreme into 3 or 5 slices and fan on top of the baby gem. Finish the dish with the sauce.